I embrace romance as a magical and loving part of my life. I choose to engage in romantic moments. I choose to experience romance in my life for and by myself . Romance evokes calm, simplicity, ease, imagination, and of course, love, but romance isn’t something that just happens, it’s created by action and perception. And it needn’t involve two people; it only takes one. By adding romance to our day, night or world, we add a bit of magic, a touch of whimsy, a hint of fairy tales, a splash of dreaminess, and a dot of innocence. Romance indulges the senses with soft soothing sounds, inspiring aromas, flickering flames, sensuous fabrics, and simple calming colors. 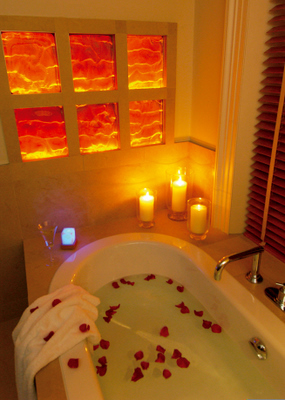 Romance is personal, something we can customize to meet our soul’s imagining. We can engage romance with a partner if there is one, or in blissful solitude if there isn’t. Whether it’s a candlelit dinner for two or candlelit bath for one, wrapping each other in satin while reading Neruda, or wrap oneself in cotton while reading Elizabeth Gilbert, we can all bring a little romance to our private moments.